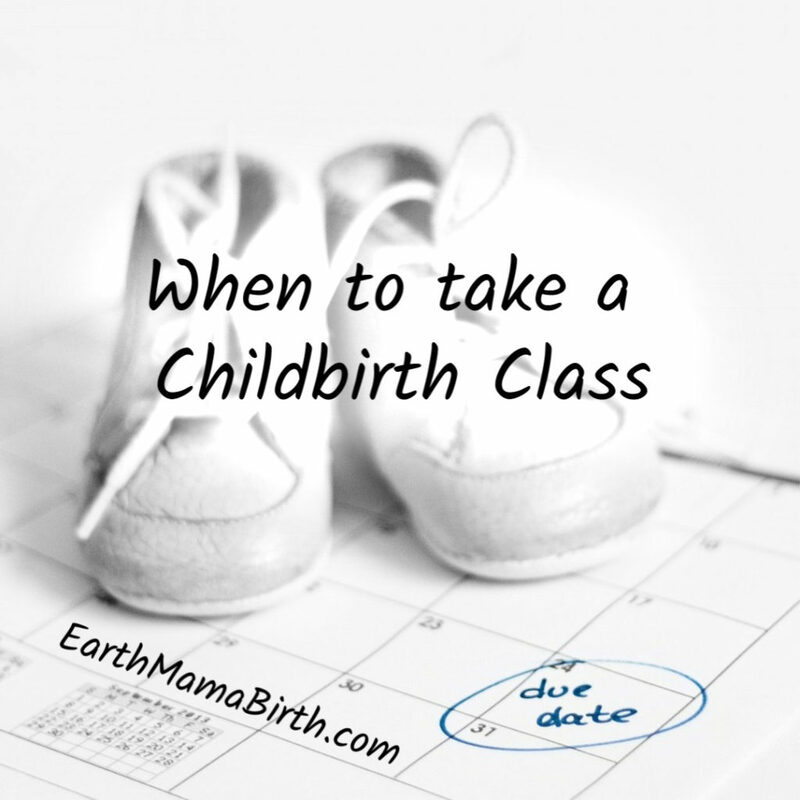 Plan on starting to look for a childbirth class around your 16th week of pregnancy. The best way to figure out when to FINISH your class is to count backwards from your guess date (which you may call your due date) about 8-10 weeks. That will put you around your 30th-32nd week of pregnancy. Yes, that’s when you want to have your class completed, not when to start it. So if you are looking at a 6 week class, you should aim to start it around your 24th week. Longer classes you will want to start even sooner. Many classes are announced 4-8 weeks before they start. This means you will want to start searching for classes in the beginning of your second trimester, around your 16th week. There are a few reasons for this. Your baby may come earlier than expected. You definitely want to know what preterm labor looks and feels like (this is something you will learn in class). Your care provider can certainly tell you about this but most of my students have never been provided this information as part of their routine prenatal care. You will want those labor coping and advocacy skills to help you through labor whenever it happens. You may need extra time to find the right class. Once you have done your homework and decided on a class format or style that is a good fit for you, there is a chance that the class may fill up quickly or be offered at a time that conflicts with your schedule. Your instructor will be more able to accommodate you if you contact them early. I have had clients contact me in their first trimester which allowed me to plan my group class around their schedule. You need time to alter your plans based on information you learn.Many pregnant people choose their initial care provider based on previous history, who is geographically closest to them and/or who takes their insurance. But not all care providers or birth settings are going to give you evidence based care or the model of care that best suits your birth intentions. Nobody wants to think they hired the wrong doctor or midwife, but during your class there is a good chance you may conclude that your chosen care provider is not a good fit. Some people will tell you that you can switch providers any time you want – even while you are in labor – but that doesn’t mean it’s easy. And, it’s better to get the type of care you want as early in pregnancy as possible. All of this begs the question, “What should I look for in a childbirth class?” Well . . . that’s entirely up to you. Birthing classes come in a variety of flavors. You will find private and group formats, as well as in-person or virtual classes, and now even a hybrid class (meets in-person AND virtually) is available through Evidence Based Birth®. You will find everything from one-day workshops to 12-week classes. There are also a number of methods offered so be sure to research the options in your area (and a little beyond) to see what works best for you! The hospital childbirth class near you may not be the only or best option, but it’s probably the least expensive. However, you may find yourself compromising on quality. If you want an out-of-hospital class but cost is an issue, be sure to reach out to the instructor you want and let them know you are interested in the class but cost is a sticking point. There may be payment plans available or a work/study option.